Much has been written about leaders and leadership. Journal articles, blogs and books try to home in on the essence of an effective leader. While there is common agreement that a executive's performance can make or break company, defining that essence of effective leadership remains the Holy Grail for those who find themselves at the top, for those who are responsible for carrying out the strategies and dictates of their managers, and for the shareholders who want to see commitment, action and positive financial return. Breaking the Leadership Mold is designed to help senior executives and managers respond to the challenges of today and shed the vestiges of days gone by. In so doing they will better lead and enable their staff, and create a work environment that is healthy, engaging, productive and sustainable. 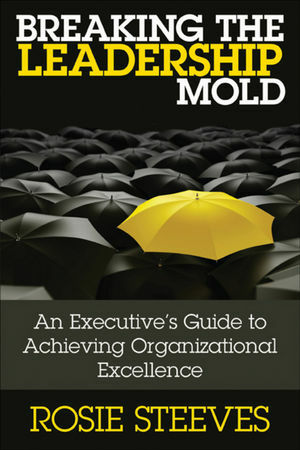 Based on the author's extensive research and 35 years' experience in working with local, national and international companies, Breaking the Leadership Mold offers 20 principles-such as Principle #10: Recognize How Executive Team Dynamics Promote Mediocrity and Principle #14: Get Other Executives On Board (or Out of the Way)--that when implemented will ensure that not only is there effective communication throughout the organization, from top to bottom and bottom to top, but also that employees and executives alike contribute to their full potential. The net result -- the organization wins on every measure. The 20 principles are built on the pillars of case studies, experience and research. Effective leadership is an absolute in any business environment, but becomes even more critical in times when businesses face unprecedented challenges and need to be nimble and responsive to change. Breaking the Mold has proven strategies to empower, unite and galvanize managers and employees -- and their organization - to enable them to prosper and adapt in a swift-changing environment. Dr. Rosie Steeves, formerly the executive director of Outward Bound Western Canada and offshore engineer, is the founder and President of Executive Works (www.executiveworks.org), a business dedicated to helping executives create great organizations. Prior to this she was the co-founder and principal of The Refinery, a state-of-the-art leadership development and organizational performance firm. Dr. Steeves has 35 years' experience in the leadership development field, working with both CEOs and senior executives of Fortune 500 companies to pursue aggressive growth strategies and small firms experiencing start-up challenges. A certified executive leadership coach, Dr Steeves has a PhD in Human Development from Fielding Graduate University in Santa Barbara and an MA in Engineering from Cambridge University, England. Chapter One—Principle #1: Face the Facts. Chapter Two—Principle #2: Break the Mold. Chapter Three—Principle #3: Define a Better Way. Chapter Four—Principle #4: Figure Out if You Have What It Takes. Chapter Five—Principle #5: Give Yourself a Leadership Reality Check. Chapter Six—Principle #6: Conduct a Personal Leadership Audit. Chapter Seven—Principle #7: Embark On a Leadership Makeover. Chapter Eight—Principle #8: Put Yourself First. Chapter Nine—Principle #9: Understand What Could Be Amiss with Your Top Team. Chapter Ten—Principle #10: Recognize How Executive Team Dynamics Promotes Mediocrity. Chapter Eleven—Principle #11: Get the Top Team Working. Chapter Twelve—Principle #12: Get the Board on Board. Chapter Thirteen—Principle #13: Develop Everyone's Leadership. Chapter Fourteen—Principle #14: Get Other Executives on Board (Or Out of the Way). Chapter Fifteen—Principle #15: Figure Out Communication. Chapter Sixteen—Principle #16: Create Communities. Chapter Seventeen—Principle #17:Tell People How They're Doing. Chapter Eighteen—Principle #18: Promote for the Future. Chapter Nineteen—Principle #19: Integrate the Hard and the Soft. Chapter Twenty—Principle #20: Never Stop.